Oy Yxpila Hinaus-Bogsering Ab was initially established back in 1981. The company changed ownership first in 1992, and the second time in 1997, when it was acquired by the current owner and an associate. The company name remained the same. After the retirement of the associate, the company was left on the shoulders of one man. In September of 2009, the ownership of the company was extended, when the owner’s children joined the family venture. The company has since then remained a family business. The long-time workhorses, tugs Akke and Orion were joined by ASD tug Aries in the summer of 2007, it being the first of its kind in the company history. The next vessel acquired was the Swedish tug Cetus, which joined the fleet in the summer of 2009, expanding the number of vessels to four. Tugboat Akke, which had served the port of Kokkola since 1964, was sold to Ab Isbjörn Oy in December of 2012. 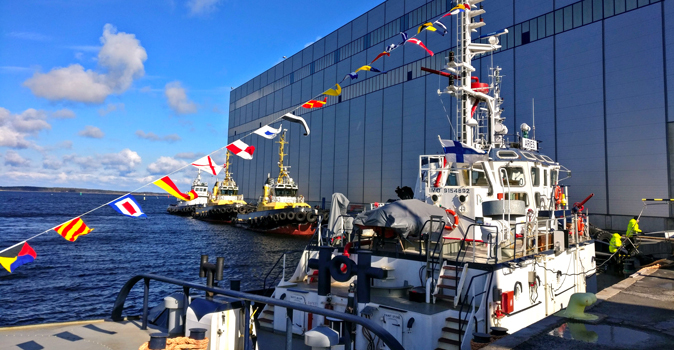 The company bought two ice-classed ASD tugs from Saint Petersburg, Russia. The first one, Taurus was delivered in November 2015, and the newest addition Draco was delivered in December 2016, increasing the vessel count to five. The current company fleet is very capable of responding to the demands of shipping in the Bay of Bothnia.